Two games will be played each evening. Register now by sending an email to: carliulti@gmail.com. 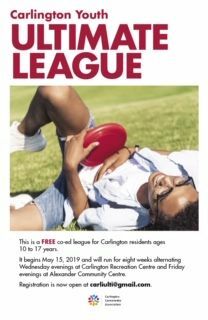 Wednesday’s games are at Carlington Recreation Centre, 1520 Caldwell Avenue. Youth aged 10 to 13 play from 3:45 to 5:00 pm. Youth aged 14 to 17 play from 6:30 to 8:00 pm. Friday’s games are at the Alexander Community Centre, 960 Silver Street. Youth aged 10 to 13 play from 4:15 to 5:45 pm.